Bronze-winged Pionus Parrots (Pionus chalcopteru) are unusually colored parrots native to South American, specifically the Andes of Colombia (except Nariño), Ecuador, Peru, and furthest northwest Venezuela. 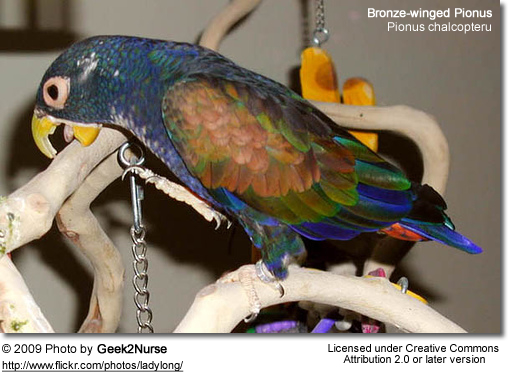 Bronze Wings are small parrots measuring around 11 to 11.6 inches (~ 29 cm) in length. They are almost purple in coloration, and their true beauty is appreciated in natural sunlight as seen in the picture to the right. They have a pronounced bronze patch on the wings. The head and nape (back of the neck) is bronze-brown. The feathers are broadly edged dark violet-grey. The chin is white. The throat is dull pink. The back, rump and shoulder feathers are dark bronze-green with blue edging. The breast and abdomen are dark green broadly edged with dark violet-blue. The under tail-coverts are red. The wing-coverts are bronze-brown. The primary wing feathers and primaries (= longest wing feathers) are purple-blue. The tail is dark blue and the outer feathers have a red base. The eye rings are white to pinkish in coloration. The irides (= plural of iris) are brown and the feet flesh-colored. The bill is horn colored. Immature birds have a greenish head and back. Their breast and abdomen feathers have a dark green edging. Bronze Wings are gentle in nature and make loving, devoted companions. They are appreciated for their sweet and fun disposition, easy-going personality and intelligence. These qualities make this parrot a good choice for first-time parrot owners and a wonderful family pet. It is also an excellent choice for apartment dwellers, due to their calm personality and easy maintenance. 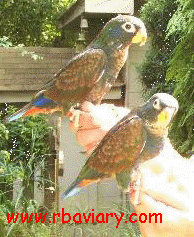 Owners describe them as inquisitive and sociable parrots that are easily tamed. They are less apt to bite than other parrot species. With a little bit of training, some may learn to mimic (although not all learn to talk!). They enjoy frequent baths as this helps to keep their plumage in good condition. 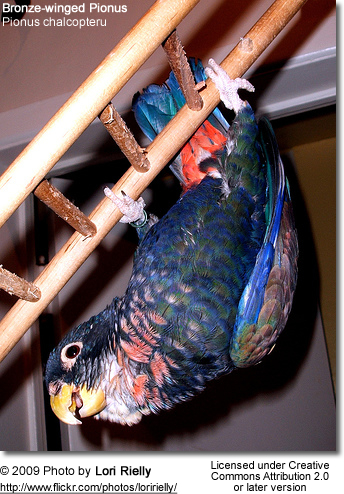 A medium-sized parrot cage is acceptable for Bronze Wings - but larger is always better, as they are energetic parrots. Toys, to keep them entertained, are always a must. They seem to be particularly fond of swings. 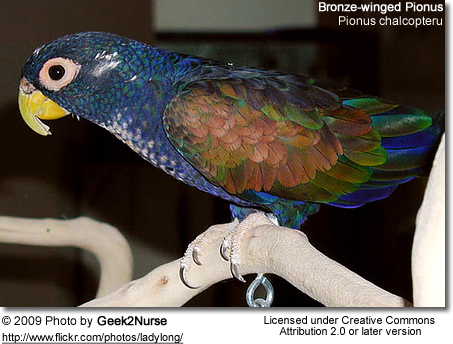 The Pionus is moderately difficult to breed in captivity and, during the breeding season, they can get noisy. If you have near-by neighbors who are sensitive to noise this should be a consideration when deciding to breed this species. 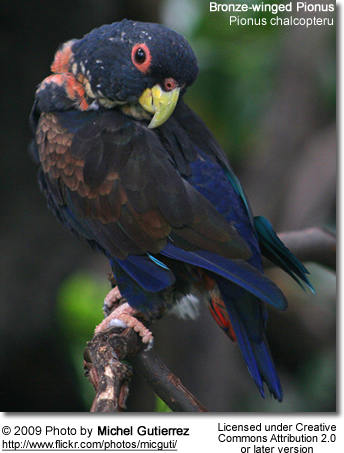 The Pionus is of breeding age when they are about 3 to 5 years old. In North America, the breeding season stretches from February or March to June or July. As far as the cage size is concerned, the following dimensions would work well: 4 feet wide by 4 feet tall by 6 to 8 feet long. Suspended cages facilitate sanitation as droppings and discarded food fall through the wire cage floor. These parrots often favor grandfather-style nest boxes and a good size would be 10" wide x 10" deep x 18-24" high. Place the nest box high up in a dark, secluded area of the aviary. 3 to 5 eggs are generally produced ina clutch. The female incubates them for 24 to 26 days. The chicks usually fledge when they are 8 to 12 weeks old. 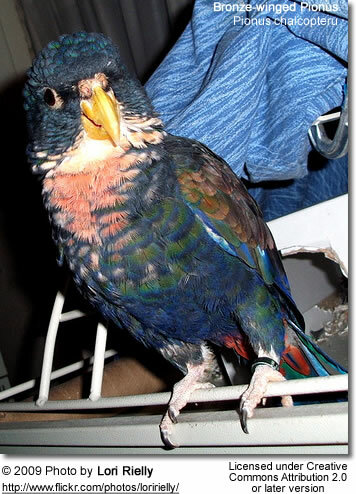 Pionus chicks are challenging to hand raise and it is best to allow the parents to take care of the chicks for at least the first week. Various green foods and meal worms are appreciated by the parents for feeding the chicks. Corn cob is a favorite weaning food.